Ask fellow campers about "Buffalo Bill State Park" and nearby attractions. We thought this campground was gorgeous in late September with the trees turning vibrant colors and snow dusting the mountain tops. Very quiet and scenic! I would rate this a 10 except that a water main had broken, and we couldn't use the restrooms or dump station. Had to drive to the other campground to access those. Also, the pull-through site was located so close to the interior road that our slide-out was right at the edge of the road. We camped at Buffalo Bill State Park in a Fifth Wheel. Site NF34, very large pull thru on asphalt in lower section. FCFS, no utilities, some shade, table, fire ring. Limited/no shade in upper section. We really liked this park. Spectacular setting, lots of grass, good dog walking. Very good pay showers. Water readily available, good dump station. No Wifi. PBS on OTA, good ATT data. Firewood is on the "pay what you think its worth" system. We had reserved site NSH04 with electric in the North Shore Campground, but site would not fit us, a 43' motorhome. The ranger sent us 5 miles west to the North Fork campground because sites are all large. North Fork is a much better campground, in my opinion. We camped at Buffalo Bill State Park in a Motorhome. 15 miles west of Cody in Wapiti. NOT the way to visit Yellowstone. It is 100 miles each way to Old Faithful, at least 2.5 hours, and there are significant construction delays. Stay in Jackson or near the West entrance for better access to Yellowstone. Cody itself is worth the visit. Lots to do and see. Great vet if your pet has problems: Cody Veterinary Hospital, Dr. Stephanie White. Best state campground ever. Very clean, all personnel friendly and helpful. Sites are widely spaced. Views are great. Some sites have water and electricity, some electric only, and some are dry. On site dump and water station. Very quite and relaxing. Dam is a must see attraction. Stayed the full 14 days allowed. When in the area, this park is our first choice. We camped at Buffalo Bill State Park in a Motorhome. We stayed at north shore which only had vault toilets and no other amenities. The toilets were kept clean. The area with the small park and showers was 5 miles away on the highway. You had to pay $1 for 3 minutes of water in the showers which I thought should have been included. Awesome views. Easy to pull in and out. Lots of space. Firepit and picnic table. We camped at Buffalo Bill State Park in a Travel Trailer. First, I don't know what we paid. I made our reservation online, a long time ago. But our site was excellent, but it our awning side faced the west so we got full evening sun. During our visit we had very warm days and lot of forest fire smoke. The campground is very scenic, lots of trees. We definitely would return if in the area. The only negative for us was no wifi. We used our sat tv so that was good for us. It was very quiet of course, our Verizon phone and hot spot worked well. By the way, the interior roads are one way but the authorities say it is ok to go the wrong way so you can set up to your satisfaction. We camped at Buffalo Bill State Park in a Travel Trailer. The Dam visit is great. And of course the Buffalo Bill Cody Center is a must. We did the Trolley tour and it was ok.
Beautify state park. We stayed in the North Fork. Easy to confuse with another area of Buffalo Bill State Park. This was not the "North Shore" area. Although slightly windy, the mountain views were spectacular; sunrise vistas were a delight. Clean water on site. 3 channels available through over the air tv. Verizon was very good. No wifi No cable, as expected in a state park. This park is past the tunnels and dam area. Friendly hosts. We camped at Buffalo Bill State Park in a Fifth Wheel. Close enough to Cody but quieter than in town. The Buffalo Bill dam visitor center is worth the time! Have been RVing for 16 years and this is one of the nicest places we have stayed. 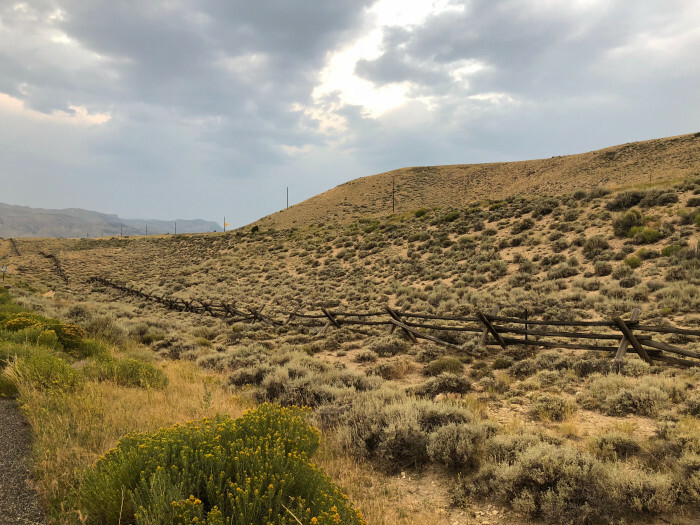 Beautiful views, well kept, plenty of room between sites, wide open spaces around site, could hear Shoshone River from site, etc. Got one of the reserved sites at North Fork with water and electric. Only reason did not give it a 10 was no sewer hook ups but dump station available. We camped at Buffalo Bill State Park in a Motorhome. Very scenic drive from Cody on South Fork Road. Wonderful campground with LONG level sites. North Shore upper loops looks like they were just repaved and new 50amp boxes installed. First loop has water and electric and reservation only, second just electric walk in, third is dry camping walk in. Not a bad site in the whole campground. We camped at Buffalo Bill State Park in a Motorhome. Dam and Cody museums were all interesting stops. We were here late May midweek two nights and campground was never more than 30% full. This place is a GEM! One of the nicest state parks we've stayed in. 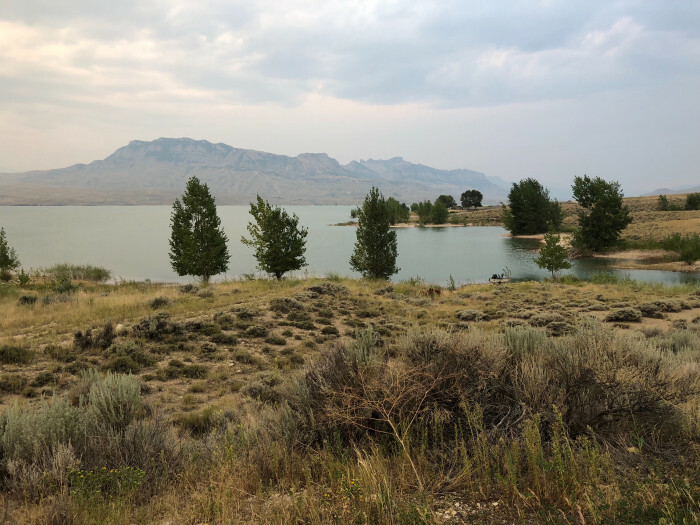 RV parking is on the north side of a huge reservoir with some of the prettiest scenery in Wyoming. Lots are spacious and on level payment. All have great views. All appeared fairly new and are well kept. Park is near the main road from Cody to Yellowstone, but the road noise isn't a problem and basically stops after dark. A really nice treat! We camped at Buffalo Bill State Park in a Travel Trailer. We stayed one night on the way into Yellowstone. It worked our perfectly. There are no nearby restaurants so plan to eat at your site. We spent 3 hours in Cody and wished we had stayed longer. A delightful community with lots of services. Was clean and in a beautiful view area. It had a dump station. Just be sure you understand the date you're supposed to leave. They will issue you a very expensive ticket. We camped at Buffalo Bill State Park in a Fifth Wheel. 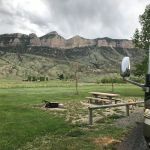 There doesn't seem to be any mention of the dry camping sites at either the North Shore or North Fork campgrounds on the website for the Buffalo Bill State Park. At the North Shore campground, there are three loops. Loop A has seven sites with water and electric that are reservable, and the cost is $22 per night for non-residents, with an additional $8 for online reservations. Sites 1 and 7 are back-ins, the remainder are pull-throughs and some are more level than others. Some sites will be more challenging for a big rig to level than others. Loops B and C in the North Shore campground are dry camping on a first come, first serve basis, and are $17 per night for non-residents. There are tent sites in Loops B and C also. Sites are nicely spaced in all loops. Most of the sites in Loops B and C are pull-throughs, but there are a couple of back-ins. The North Shore campground has many sites that are adjacent to the lake. Verizon data and cell worked well in both A and B loops of the North Shore campground. There are no trails, but there are plenty of areas to walk pets. There are pit toilets at North Shore, but no showers. It's about 10 miles to Cody from the North Shore campground and about 15 miles from the North Fork campground. At the North Fork campground, there is a loop that has reservable electric and water sites, a loop of dry camping, and a loop of first come, first serve electric and/or electric/water sites (some sites have electric only). The roads in both the North Shore and North Fork campgrounds are paved, as are the sites. There are showers at the North Fork campground. Both campgrounds are suitable for big rigs. There are picnic tables and a fire grate at each site at both campgrounds. We camped at Buffalo Bill State Park in a Motorhome. I'm not a museum person per se, but the Buffalo Bill Center of the West was one of the best museums I've ever visited. Tickets are good for two days. If you don't want your two days to be consecutive, tell the agent and they will make a note on the receipt of your second day/date. We went on a Wednesday and a Saturday. The Dug Up Gun Museum was quite interesting as well. There are many restaurants in Cody. We stayed at the North Fork campground (not North Shore). The setting is really marvelous. The high buttes and cliffs along the Shoshone river, along with the lake shore are a beautiful combination even during the dry summer. Unfortunately, there are no swimming beaches. That was our sole disappointment. We are fishermen, but that activity is available. Some sites have electricity and water, others only electricity. We had the latter. That was fine. I filled my freshwater and later dumped my waste tanks on the way out. The folks that run the campground are very friendly. The spaces are wide open and the grass was reasonably green. Cody, WY is a 20 minute drive to the east. The electricity was stable and our neighbors were quiet. There are some trees around, but shade is at a premium. Considering the price, the beauty of the area, and the easy access to Cody, I would recommend this campground. We camped at Buffalo Bill State Park in a Travel Trailer. Buffalo Bill Center of the West museum is well worth the time. It's HUGE. and quite fascinating. I wasn't a big fan of the gun museum, but everything else we loved. My daughter had fun doing a scavenger hunt for different art pieces. Stayed in A loop with water and electric. Site #5 was very sloped but we managed. The view, the quiet and the evening sky made up for any inconveniences. We camped at Buffalo Bill State Park in a Motorhome. See the Buffalo Bill Dam. Well worth the hour. Convenient overnight stop when traveling to Yellowstone, NP. Located on a beautiful lake making for nice walks in the evening. Some campsites are oriented with the campsite amenities located on the driver's side making for some awkwardness when using the picnic table and fire ring. Good value. We camped at Buffalo Bill State Park in a Motorhome. This review is for the North Fork part of Buffalo Bill State Park. Great little park in the outside of Cody to stay at before Yellowstone visit. Only 8 electric sites, the rest have no services. Beautiful mountains on both sides. Verizon worked well. Good satellite service. North Fork does have showers and I believe North Shore doesn't. Great for an overnight or two. 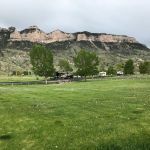 We camped at Buffalo Bill State Park in a Travel Trailer. Quick tip...if you are using this camp as a base for seeing Yellowstone, know the drive to the park daily is 2 hours one way because of curvy roads, be advised! Old Trail Town has historic buildings (Butch Cassidy) and an historic cemetery (Jeremiah Johnston). It's near this campground. Cody Museum - 1 ticket gives entry to all 5 of the Buffalo Bill Center of the West's Museums. This has a top rating from Trip Advisor. 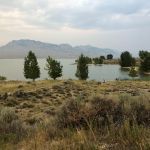 Campground is conveniently located as a base camp for all the Cody attractions, and on the road to Yellowstone if you are wanting to day trip up. TENT AT YOUR OWN RISK. HIGH WIND RISK. Visit the Irma Hotel for sure. Had a great meal for a reasonable price at A Proud Cut and a great haircut and color at Strandz. Going to the rodeo tonight and the museum tomorrow. 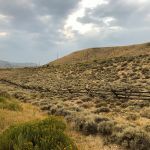 See old town in Cody where Jeremiah Johnson is buried. Try and be on the outside loop to have your door facing the lake. Everything is close by. The must sees are the Buffalo Bill dam, the Buffalo Bill museum, the Irma Hotel and be sure to take a trolley ride. Loved Cody! Cody museum, Nightly Rodeo, Street Shootouts. Cody Museum is a "must see" as is Yellowstone park. Old Faithful and Buffalo herds are all within driving/riding distance. Be careful pulling in, there are a small number of trees that can cause serious scratches on your coach. Only about 39 miles from yellowstone National Park and 15 miles to Cody. We camped 4 days and could have stayed longer; we didn't see everything. There were mule deer and elk so close and beautiful geese that flew over everyday. We would highly recommend this park. Be sure to tour the Buffalo Bill Center of the West to learn all about Buffalo Bill Cody. There are six museums in the complex so wear good walking shoes. Lots to explore in Cody, including the Old Town, the 7-acre under 1 roof Cody Museum, and breakfast or lunch at Irma's. Are you affiliated with Buffalo Bill State Park ?